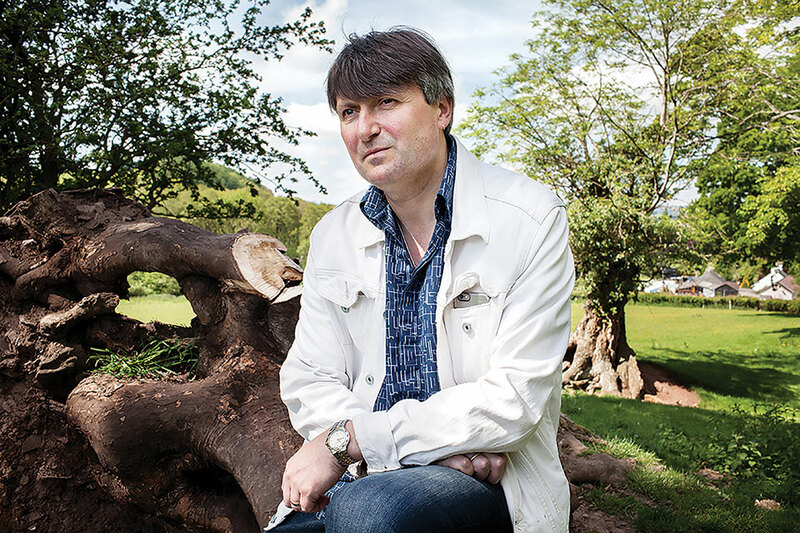 Prolific poet Simon Armitage (b. 1963, Marsden, UK) is also a novelist, playwright, lyricist, librettist, translator, and author of several books of nonfiction. In this interview, conducted while visiting Oklahoma City University in April as part of OCU’s Thatcher Hoffman Smith Poetry Series, Armitage discusses poetry as his original inspiration, writing from West Yorkshire, and translating Sir Gawain and the Green Knight. Rob Roensch: You work in so many different genres, different kinds of writing, but for you, you said, “It’s the poems which count.” We were both struck by this quote. So why, and what does it mean to count? Simon Armitage: The poetry was the reason I picked up a pen in the first place. That was my first powerful experience of writing. I couldn’t not respond to these intense blocks of language as I first encountered them at school. I knew from that moment that I wanted to be involved with poetry. I don’t know if I knew that I wanted to write it at that stage, but I knew that I wanted to read it, that it was going to be something for me and a place to go. I guess it’s first-love syndrome. Everything else that I’ve done has been an excursion from poetry, or a wider adventure within it, but poetry is at the heart of everything, and it’s poetry that I keep coming back to, and it’s poetry that I want to keep writing until the end. Everything else that I’ve done has been an excursion from poetry, or a wider adventure within it, but poetry is at the heart of everything. I suppose it counts because I see it as a very sincere form of language. In a workshop yesterday, I was asking people for their definitions [of poetry], on the basis that if we work with the stuff, we should know what it is, and I was talking about how difficult it is to define as a substance and as a subject, but I like the idea that it’s language at its most subtle and its most supple, a language that is very flexible but precise as well. And it counts because, increasingly, we live in a world where we’re surrounded by 24-hour, 360-degree noise and information, and it’s hard to hear yourself in that world sometimes, and if poetry is just one voice saying something that it really means, surrounded by the white space of silence, then it really becomes even more significant and important than it has ever been. And there aren’t that many of us either, so it’s important to keep carrying the card, flying the flag. RR: Do you remember any of those first pieces of language that you encountered as a child? SA: It was school, so I was fourteen, fifteen. We were reading Ted Hughes; we were reading his animal poems: “View of a Pig,” “Pike,” “Second Glance at a Jaguar.” There’s a First World War poem of his called “Bayonet Charge,” and I can still remember the hairs on the back of my neck standing up. I was a very sleepy student up to that point. Virtually comatose, really, wasn’t interested in anything; nothing was interested in me. Those poems were my awakenings. I was talking about it this morning, suddenly becoming alert to the idea that there are only twenty-six letters in the alphabet, just black shapes against a white background, but if you can put them in the right order, then you can make incredible things happen in somebody else’s head, in complete silence, across hundreds of miles, across thousands of years. That struck me there and then as an act of primitive magic. I still feel that sometimes when I encounter very powerful work. RR: How does that way of thinking about poetry guide the way that you try to teach? SA: I’m always conscious that I’m not just trying to incubate mini-me’s. My students come along with all kinds of ideologies and attitudes toward language and different versions of what poetry is. And I really just try to encourage their enthusiasms. My starting point is nearly always the same, which is to point out to them that they’re unlikely to write if they don’t read (you would be surprised how many times you have to keep saying that), and to encourage them to find six or seven gods or goddesses whose work they’re absolutely transfixed by, who represent their guiding constellation, and whose voices and ideas they might want to emulate to begin with. I’m an old-fashioned poet. I’m a communicator. I’ve said many times that if you don’t have readers, you don’t have a poem. Not everybody seems to believe that—or you might come to that conclusion by looking at their work—so I suppose I try and encourage some of that in my students, but they’ve got their own ideas. I’m just a facilitator, a croupier in the class, just moving the chips around. RR: Your point about communicating goes into my next question. I wanted to ask about your sense of audience as a poet. 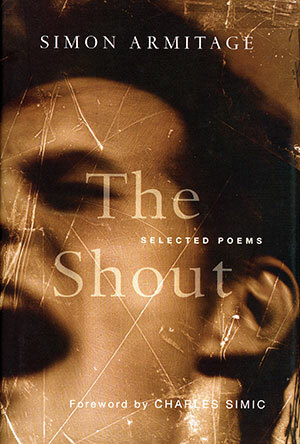 You said about The Shout, “[I] called the book The Shout hoping the voice would be strong enough to carry across the Atlantic.” To what extent do you see yourself writing to a local audience, and to what extent do you see yourself writing to English-language speakers, or to the language itself? SA: When I sit down to write, my imagined reader or readers are probably British. The nods and winks in the poems, and the little codes and systems by which they operate, are very much to do with the English language in Britain. But you don’t have to be a genius or a translator to work some of those things out, even if you’re not native. It’s a peculiar thing to find yourself five or six thousand miles from home reading little poems that were written looking out of a window in West Yorkshire about what you could see through that window. I’ve always felt that you just need to be true to your origins and your instincts, and if the work then goes on to have a life beyond those borders and boundaries, then that’s a bonus. Some people write in a very universally symbolic way. If you take a poet like Neruda, I’ve always thought he was very translatable. Flowers, planets, rivers, mountains, stars, love. We all know what those things are. My poems are, on occasion, very colloquial, and I’m not sure how they operate in other language systems, or in other countries. But you couldn’t begin to start making allowances for that. It would take you too far outside your own idiolect, outside your own register. It’s the same with posterity as well. I’m a firm believer in just writing for the here and now. You can’t hope to know how the language will develop in relation to your poems, or how taste will develop in relation to your poems, either. Just try and write to the moment. RR: Could you talk about an instance where something came out of the writing process and surprised you in a way you weren’t expecting? SA: I have a little poem called “The Shout” about conducting a science experiment at junior school. I went into the school yard with another kid, and he started shouting and walking away across the village, and at the point I could no longer hear him, that would be the size of the human voice. I knew for a long time that I wanted to write about it, and I also knew that the kid had committed suicide in Australia, and I somehow wanted to join those things together. It seemed an obviously poetic idea, that he’d walked away shouting, and I was listening for him all the time, until I finally heard via somebody else how he had died. But I didn’t know how to finish the poem, so even though I was confident about the material I didn’t know what destination to aim for. And then, just through trial and error with different word combinations and moving sections of the poem around, I ended up with this last line: “You can stop shouting now. I can still hear you.” It was a line I’d positioned in the middle of the poem originally, chronologically attached to the actual event, rather offered as an abstraction. That moment of transformation came about simply by rescheduling the order of ideas, a place I probably wouldn’t have arrived at through verbal description of the incident or even in a prose paragraph. I have another poem—this feels incredibly immodest, by the way, sitting here talking about my work—where, again there’s an element of West Yorkshire magic realism (i.e., mainly realism), where I set off for a walk as a teenager, and when I arrive back in the house at the evening, I’m married with a child. There’s a line in the poem that simply states, “I have promised not to go far.” In the poem, that’s a transformative moment, because it’s not just about distance, and staying local, but it’s about ambition. The poem contradicts the promise not to be ambitious, not to try new things, not to say things out of order. It’s moments I’m talking about, I guess, moments you just couldn’t see coming when you embarked on the poem. When you tip the kit out of the box, they’re not there. They come later somehow, in the making. RR: I really love that phrase, “West Yorkshire magic realism.” Could you talk more about that as a worldview, and what it means to see the world that way? SA: Well, I don’t know how well you know the geography of Britain, but Yorkshire is generally seen as part of the industrial, postindustrial North, and has been the home of kitchen-sink drama, very realistic, almost documentary-style drama. It’s seen as down-to-earth, working-class, etc. I’m generalizing here, because it’s a huge county, but that tends to be its character, especially when described by people from outside. But the longer I’ve stayed there, I’ve felt as if I’ve located a kind of visionary magic in the landscape, and that I don’t have to be tied down by those traditional images of what Yorkshire represents. I grew up partly on the moors, these big open spaces, and they seemed to be places where anything could happen, or where you could imagine anything could happen. There was never anybody there, so they were yours for the taking, really, especially when you wrote about them. Those moors have never found their place in literature. There’s The Hound of the Baskervilles, and Wuthering Heights . . . that’s pretty much it, really, and then the Ted Hughes poems. I was quite introspective as a kid; I spent a lot of time on my own on those moors, and it led to daydreaming. The writing that tended to come out of Yorkshire had been quite earthy in previous generations. With “The Tyre” I was trying to suggest other possibilities. RR: Obviously, childhood is really important subject matter. Could you talk about why it’s particularly important for you, and also why it’s such a typical topic for poetry? SA: I’ve talked a little bit about the potential of childhood, and not seeing the world as a fixed place, childhood being a place where anything could happen. It’s enormous capital, childhood. It’s always there in reserve. It feels on occasions like very good material for contemporary parables, and a lot of my poems take on qualities of parables. I have a poem called “The Straight and Narrow,” which is about a visit from the careers adviser at school. This was at a time when there weren’t any jobs anywhere, so it was a pretty awkward encounter. It was a little bit like having your fortune told. This man arrived in the school—he wouldn’t exactly read your palm, but that’s how it felt—and at the end of the day it was foretold you’d become a mechanic, say, or a dentist. But never a poet! In the poem, I write about this very nervous adviser faced with fifty pimply, semibearded youths who were just impatient to leave school anyway. He had one of those carousel slide projectors, which I always loved. I loved that clunk as the slide dropped in. I have a soft spot for analogue clockwork technology. And he showed a slide, against the wall, of an X-ray of a girl’s stomach, a girl who’d swallowed a metal toy car, and it was absolutely beautiful. You could see every detail on it. I conclude in the poem that it was a sort of Frostian moment for us, where we all recognized that something incredible had happened. I make the point in the end that for some, it had conferred in them the notion that they were going to become astronauts. It had fired their imaginations. Something incredible was going to take place from that point onward. And other people who had seen the same image were destined from that point to become taxi drivers and to remain local, regional, parochial. Quinn Carpenter Weedon: You were a probation officer for a while. I could see you getting good poems out of that. Did you? How did that add to your poetic career? 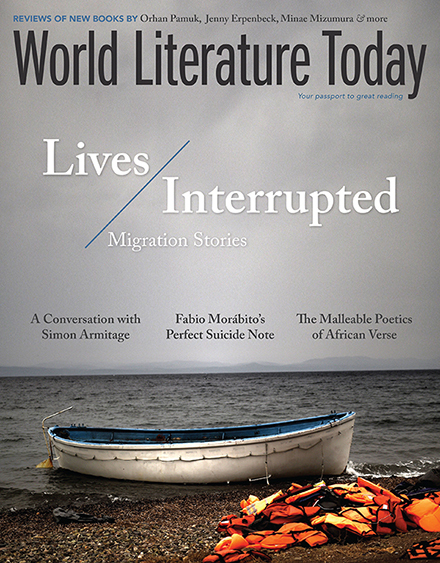 SA: My first book is full of poems set in that environment. It offered rich pickings, really. And different vocabularies, because, as well as working with people in the criminal justice system and in prisons, I was working with lawyers and social workers and health care professionals, so there were lots of vocabularies and registers swirling around, lots of different sketches and scenes. It was tough work. There had been a big heroin explosion in Manchester at that time, so it was nearly all drug-related work. And I was probably working through some of the issues in the poems, coming to terms with such warped realities, or at least having a rest from probation work by writing the poems, and taking back a little bit of control. One of the problems with working in probation was that there was no product. You could put endless amounts of effort into a client, and genuinely, after five or six years, conclude that you’d made no difference whatsoever in that person’s life. Whereas you could control a poem. You could manipulate, shape, and fashion it, then have something finished, something to show. At some level I’ve always wanted to be a maker, but I’m no good at drawing, or making pots, or anything like that, so what I’ve ended up doing is making things with language. That’s the root of the word “poetry,” anyway: “to make.” I really missed that when I was working for the probation service. At some level I’ve always wanted to be a maker, but I’m no good at drawing, or making pots, or anything like that, so what I’ve ended up doing is making things with language. I’ve started writing again about things back in the day, particularly about prison, actually, and over the years I’ve made several films on similar subjects, documentary films that have a written component. I guess you could look at those films and say they are all about marginalized people, so maybe I’ve continued to practice as a social worker but through film and poetry. At the time I was just trying to make successful films, but I wonder if there’s some do-gooding in there. QCW: To kind of give them a voice in that way? SA: Exactly, giving people a voice, yeah. A lot of the projects I’ve worked on have involved writing for spaces where people’s voices are being taken away. I wrote a prose drama called Black Roses about a young woman who’d been kicked to death in a park in Lancashire and, at the invitation of her family, wrote poems in her voice. It’s exactly as you say: she’d had her voice eradicated, so I wanted to speak up for her. In the other films, it’s about reinforcing and strengthening people’s voices, when they’ve got important things to say but aren’t always the most articulate. RR: I thought it was interesting when you said, “Some writers swoon over language, saying, ‘It’s my muse, my lover,’ and so on. Well, it’s my enemy. I seem to spend all my life arguing and battling with it.” I wonder if you could talk more about that idea of battling with language, how poetry comes out of argument and struggle and making, as opposed to just inspiration from on high? SA: Actually, that article was a case in point. You reading it back to me now seems very fluent; it seems to have come from somebody who can write, but I don’t find it easy. I’m an ideas person. I have dozens of really good ideas every day for poems; my notebook is full of ideas, ideas, ideas, but the ideas are not the poems. Lots of agonies for me to go through to get the poems to their finished drafts. I know many poets who are far more natural writers than I am, and can produce something close to a first draft just on sitting down. I’m nowhere near that when I sit down for that first draft. All I’ve got are the big Hollywood words, the obvious ones. If it’s a poem about a kite, I’ve got “kite,” “string,” and “sky.” Beyond that, I’m swimming through bricks. RR: What’s it like to take on such a large project, translating Sir Gawain and the Green Knight, and how do you balance the desire to be true to the text with making it accessible? SA: I signed up to translate Sir Gawain and the Green Knight . . . well, I say signed up. I submitted an idea to my publishers, and to my American publishers, and they wanted me to do it, so I signed all the contracts, and then I thought, “I have no idea what I’m doing here.” I had a lot of false starts, actually, with that poem. The background was really one of coincidence and superstition. I’d bumped into the poem again after years of not having any contact with it and, for various reasons, went from not knowing a great deal about it to, about three months later, thinking I was put on this earth for no other reason than to bring Gawain home. I probably wanted to do something a bit more radical with it to begin with, but I was working with a couple of medievalists in the States and my editor in London at the time, who knew a lot about the poem, and they guided me toward something more faithful than my original intentions, for which I’m grateful and relieved. It was radical to the point of being unrecognizable, to begin with. Norton, my US publishers for that poem, provide for a more academic or educational market, and they wanted something they could publish as a parallel text, so it brought me into line slightly. It was painstaking work to begin with. I had never studied Middle English. I had to get very familiar with it, so it was dictionaries, glossaries, other texts, until the stage where I could read it off the page, pretty much. I’ve gone on to make two other translations from the same period, largely because, for the very first time in my life, I was bilingual. Well, I say bilingual; I can only speak to people who have been dead for six hundred years and who lived in the Midlands of Great Britain, but I didn’t want to lose that familiarity with another language. I also realized as well, with the translation, that [it was] the very first time I could get on with poetry every single day. You all know this; you don’t feel like writing poems all the time, and people certainly don’t feel like reading them. You just can’t exist at that pitch, so you end up working on other things, or you sit around twiddling your thumbs. You still have the urge to write, but you just don’t feel like writing poetry. With the translation, I absolutely could, so no matter how grumpy or hungover I was, I could get into my study, and I could crunch through ten lines of Sir Gawain. It was very portable as well. I could take it everywhere I went; I could work on it on the train. I mean, I took up quite a lot of space. So that was a real breakthrough. I didn’t realize that was going to happen. It started as quite a small project, something I was doing with my other hand, and it became enormous. In fact, in the States, if I’m known at all, that’s really what I’m known for. It’s sold over a hundred thousand copies now. As a poet, you’re not used to naughts on the end of numbers. With the Greek myths I’ve worked on, the Odyssey and the Illiad, they’re dramatizations rather than translations, so it was a case of closing the books and reimagining scenes as dialogue. Those were different experiences, different adventures. I’ve translated a little of Virgil, agonizing dictionary work. I’m probably finished with Middle English, though. I’m not sure there’s another poem from that period that I want to translate. I’ve finished writing nonfiction as well. I’ve published some books about walking, which are memoir as well, of a kind. But I really just want to think about the poems from now on. Maybe some more theatre, but even the plays I’ve written are based on old poems, or they’ve got poetic textures within them. RR: You said you wanted to “bring Gawain home.” Why that poem, and why did you think we needed it? SA: Well, the poem itself has become the plaything of academics, and the plaything of their students, reluctantly sometimes. Academics and scholars make wonderful restorations of the poem, without which I wouldn’t have been able to move forward. But they’re generally interested in word definition, and in finding the equivalent contemporary definition of a word in the original text, you probably move away from its acoustic value. What gets lost is the musicality of the poem, the alliterative musicality of the poem. I wanted to foreground and showcase that musicality, because without it, it’s just a story, really. Just narrative information. I felt as if I were bringing it home poetically, and geographically as well, given that it was probably written by somebody who lived just over the other side of the hill. I’ve included a few dialect words, and I left some of the original words in there. So the idea of bringing him home was a slightly sentimental and superstitious idea, but it functioned as a helpful motivation. QCW: At the beginning of this interview, we talked about this new world we’re living in, where we have all this information, all these outlets. So what advice do you have for students who are writers in this new environment, but also students who are just citizens of the world, and are consuming literature and information in this new climate? SA: I’m not a good person to come to for advice. I’m not the Citizen’s Advice Bureau. I’m unreliable, make bad predictions, bad choices. I’ve got a daughter who’s seventeen, and she has a better grasp of the new world than I do. I can point people toward what I believe are great poems and great texts, and I can share my enthusiasms with them, but these are people who know more about how the world works than I do now. I have to ask them how to switch my phone on. QCW: Do you think that we’ll always be able to find the good stuff? SA: I think the notion of what that good stuff is will change dramatically. But I’m continually impressed by how many young and committed writers there are around, people who still want to immerse themselves in literature, and by and large I find that incredibly inspiring and optimistic. They will be the ones who define the good stuff, what works and what doesn’t. Like offspring deciding which care home we’ll end up in—so be nice to them. 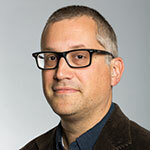 Rob Roensch is an associate professor and the Clary Endowed Chair in creative writing at Oklahoma City University. Quinn Carpenter Weedon is an advanced poetry student in Oklahoma City University’s undergraduate English program.